Not a lot to add since the last report and this is likely the last one from Oklahoma unless something out of the ordinary occurs. 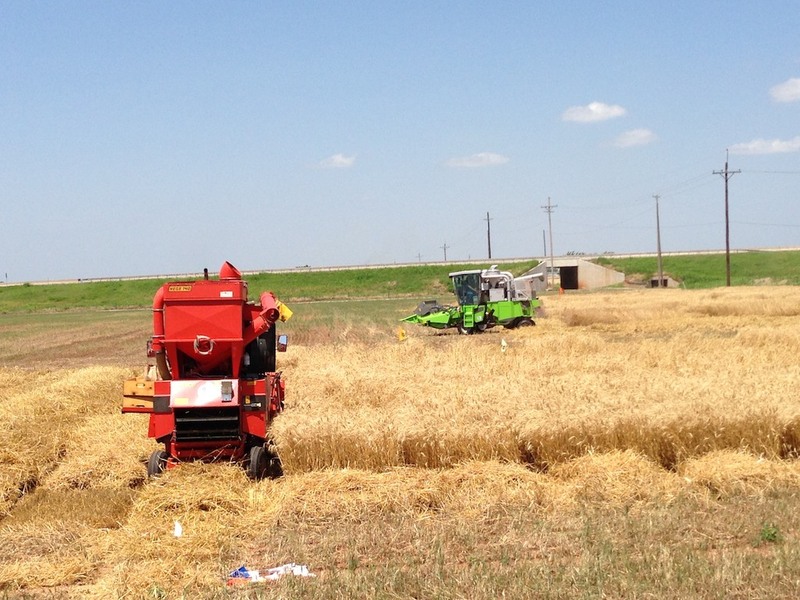 Wheat is being harvested in southwestern OK. I’ve heard reports that ranged from “about 180 bu from 50 some acres” up to around 30 bu/acre. Wheat around Stillwater is typically at medium dough with very little green leaf tissue left in the leaves. Stems are still mostly green but also beginning to fade. All of the wheat I looked at on Monday had 3 plump kernels/mesh. A field day last Thursday (30-May) in Pawnee County (30 miles northwest of Stillwater) revealed a trial and surrounding field with severe leaf spot. Isolations from 3 varieties all yielded Pyrenophora (tan spot) and Septoria/Stagonospora with tan spo (Pyrenophora) more common than the other two. The wheat was approaching dough, so I don’t think there will be a huge yield hit – especially given the moisture and cool spell we have been having. I have only rarely seen tan spot and the leaf spot diseases in general this severe in Oklahoma. Dr. Ned Tisserat (wheat Pathologist at Colorado State University) confirmed our suspected diagnosis of bacterial streak/black chaff in the variety trial at Chickasha (about 40 miles southwest of Oklahoma City). Symptoms were widespread and quite severe across all varieties, but similar symptoms due to leaf spots, drought, and freeze also contributed to the overall burnt appearance to the trial. Finally, Bryan Vincent (crop consultant – north central OK) sent in photos of isolated spots in a wheat field in Kay County (just south of Kansas in north central OK). Although no sample was submitted, the photos and description of the situation definitely indicated this to be take all. Kansas – Dr. Erick De Wolf (Professor/Small Grains Extension Pathologist, Kansas State Univ, Manhattan, KS) 03-Jun-2013: Fields in Central Kansas are maturing rapidly now and many fields were at the milk stages of development last week. The levels of stripe rust and leaf rust remain low in Kansas this year despite some earlier reports of stripe rust when the wheat was heading. It appears higher temps have slowed the development of stripe rust. Only trace levels of stripe rust can be found in most plots and commercial fields I visited May 27-31in Republic, Smith and Phillips counties (North central). Rust was absent from plots and fields I checked in Eills, Rush, Ness, and Lane counties (west central KS) this year and drought remains a serious issue for these growers. I observed low to moderate levels of leaf rust in a variety testing location in Reno county (south central KS) on May 31. The incidence was near 80% but severity was still very low (generally less than 2%) of the flag leaves of susceptible varieties such as Overley, Jagger and Jagalene. The wheat in this plot was at the milk stages of kernel development so I do not expect any significant yield loss at this location. Nebraska – Dr. Stephen Wegulo (Small Grains Extension Pathologist, Univ of Nebraska, Lincoln, NE) 30-May-2013: This afternoon I looked at breeding nursery plots in Lincoln (Lancaster County, southeast Nebraska). I found trace levels of stripe rust. The predominant disease was powdery mildew in the lower canopy, followed by leaf spots, mainly Septoria. There was a low incidence of Fusarium head blight (FHB) at low severity (one spikelet bleached on wheat, more on barley and in one case an entire barley head bleached). I suspect FHB is going to be a problem in the eastern part of the state. The timing of heavy, continuous rainfall coinciding with heading and flowering couldn’t be better for FHB development in the eastern part of the state. We have had these conditions over the last week or so and even before. Dr. P. Stephen Baenziger, UNL small grains breeder, happened to be at the nursery when I arrived. He told me his team saw stripe rust at higher than trace levels in a breeding nursery at Mead (about 30 miles north of Lincoln). Conditions are perfect for rapid development and/or spread of just any fungal or bacterial disease in eastern Nebraska. I also saw low levels of barley yellow dwarf virus in lines that appeared to be susceptible. A sample with virus symptoms I brought back from Saline County (also in southeast Nebraska) last week has tested positive for wheat streak mosaic.